Focus On... - Slade Crazee! Miscellaneous / Flexi Discs etc. Sheet Music / Books etc. 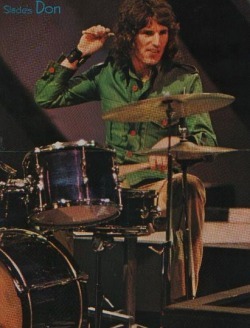 Don is considered to be one of rock's finest heavyweight drummers of all time.He co-wrote some of Slade's earlier songs most of which can be found on the 1970 album "Play It Loud".He also co-wrote the smash hit single "Look Wot You Dun" and supplied the panting sounds on the actual recording. At the peak of Slade's career in 1973 Don was seriously injured in a car crash,sadly his 20 year old girlfriend Angela was killed.Two off duty nurses were first on the scene and managed to keep Don alive until the emergency services arrived. On arrival at the hospital surgeons had to drill a hole in his skull to relieve the pressure and he lay unconscious for six days. Amongst other injuries he sustained were two broken ankles and five broken ribs. Because of the seriousness of the situation the other band members considered cancelling tour dates, but Jim Lea's brother Frank volunteered to step in as cover for Don. By mid-August Don was back in the recording studio with the group recording the next single "My Friend Stan". To this day he still has problems with his short-term memory whilst his long-term memory is unaffected.The accident also left him with no senses of taste or smell. 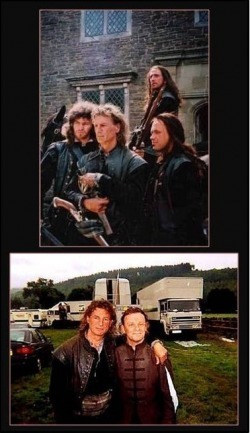 When Slade went their separate ways after the "Universe" single Don concentrated on his antique import/export company. By 1993 Don and Dave Hill decided to reform the band with new members and called it Slade II, the name was shortened back to Slade in 1997 with the blessing of Noddy & Jim. Don had mentioned to Dave Jewell that he was interested in doing some film or television work. Dave contacted and told his agent that Don would like to join the agency.Within a couple of months they both landed parts as drunken villagers in the TV adaption of the R.D. Blackmore novel. As they were wandering around the set dressed up in their costumes one of the crew noticed Don and re-dressed him. The producer noticed the change of costume and thought his rugged good looks were perfect for a role as one of the Doone's and was recast. Don's cameo role took just over a week to film (Filmed in Wales) and the two part drama was shown on UK Television on Christmas Eve and Boxing Day later that year. Photo's supplied by and with kind permission from Dave Jewell. Don has been married twice and for a number of years lived in Bexhill-on-Sea,East Sussex. In 2004 he moved to Silkeborg,Denmark where he now lives with his Danish girlfriend. In December 2005,Don and Dave Hill appeared in the Channel 4 Documentary "Bring Back...The Christmas Number One" with Justin Lee Hawkins. On the 4th December 2008 Don was on TV screens again making an appearance on "Never Mind The Buzzcocks". Dave is well known as being the most outrageous member of the band due to the bizarre costumes he wore and the huge platform boots. Like Noddy he was a showman but in a visual way, you just could not notice the guy. In 1973 he added the custom-made "Superyob" guitar which complimented his stage image perfectly. He embraced the idea of "yob" culture and along with the guitar he used the number plate YOB 1 on his cars. Even though he is left-handed he plays guitar right-handed which stems from his younger days. When he first started playing, right-handed guitars were so much cheaper to purchase so he adapted and to this day he has never changed back. Dave used to keep his new stage outfits secret from his fellow band mates until just before a performance. In the dressing room Noddy would shout "H reveal" and out would come Dave. I've heard that Jim used to cringe at the sight of some of the costumes which caused some friction, but Dave's answer to that was "You write 'em, I'll sell 'em". 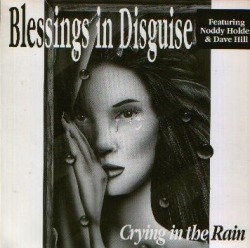 In 1989 Dave and Noddy recorded a cover version of the Everly Brothers classic "Crying In The Rain", the flipside was "Wild Nights" written by Dave and Bill Hunt. 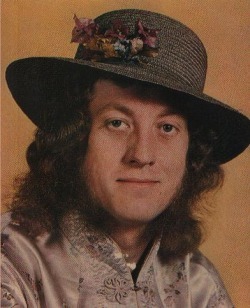 Noddy sang lead vocals on both songs and the record was released under the name Blessings In Disguise. In 1991 Dave revived the Blessings In Disguise name for a charity single "Chance To Be" which was released to raise money for The Queen Alexandra College for the Blind in Birmingham. Noddy Holder did not feature on this project. In 1993 Dave reformed Slade with Don Powell and after various line ups have continued to perform to this day. Dave married his wife Jan in Mexico City in the 1970's and have three children: Jade, Bibi and Sam. They now live in Lower Penn, Staffordshire where Dave occasionally teaches music at two of the local schools. In 2001 Dave appeared on a Comic Relief version of Never Mind The Buzzcocks. In December 2005, Dave and Don Powell appeared in the Channel 4 Documentary "Bring Back...The Christmas Number 1" with Justin Lee Collins. While on tour in Germany (July 2010) Dave suffered a mild stroke and was taken to hospital. Thankfully he has made a full recovery and is touring again. Noddy has one of the greatest and recognizable rock voices of all time. Not only was he a great singer but also a great showman learning his craft on the live circuits during the early days. He had the knack of getting the audience involved right from the start,you had to witness it to believe it, absolutely fantastic and memorable every time. He was the last member to join the 'N' Betweens after briefly meeting Dave and Don on a ferry en route to Germany in Oct.1965. He didn't join straight away as he still had touring commitments with Steve Brett & The Mavericks. After returning from Germany he bumped into Don and Dave in Wolverhampton,they all went for a coffee and he was finally persuaded to join after being told they'd just signed up a talented young bass player (Jim Lea). The lead singer of the 'N' Betweens at the time was Johnny Howells who left shortly after,leaving the four young men who were to become the mighty Slade. In the early days all four members had a hand in writing songs but the song-writing combination of Noddy and Jim was the most fruitful, as most of the bands hits were written and composed by them. Since leaving the band in 1992 Noddy turned his hand to hosting his own radio show on Manchester's Piccadilly Radio. In 1996 he was the subject for the TV show 'This Is Your Life' hosted by Michael Aspel - amongst the guests were Suzi Quatro, Roy Wood and of course Don Powell,Dave Hill and Jimmy Lea. In the late '90's Noddy landed a part in the successful TV series 'The Grimleys' as music teacher Neville Holder. Fellow '70's rocker Alvin Stardust also had a bit part in the series appearing as Alvin the barman. 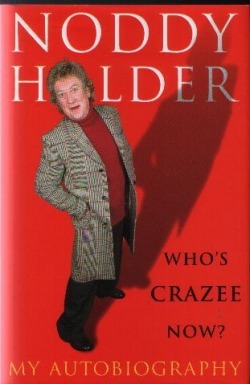 Noddy's Autobiography "Who's Crazee Now" was published in 1999 (Hardback) by Edbury Press Limited. 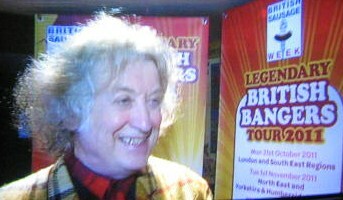 Noddy visited many outlets to publicise the book where fans had their newly purchased copies signed. In 2000 Noddy received the MBE for his services to music and on the 8th December he played a character called Stan in a live 40th anniversary episode of 'Coronation Street'. Also in this year Noddy's voice was recorded to make lift announcements for the New Art Gallery in Walsall and an updated version of his autobiography was published in paperback. From 2000 to 2004 he went back to hosting radio shows for Century and Capital Radio and even now is a regular TV critic and reviewer on the Mark Radcliffe and Stuart Maconie Show on BBC Radio 2,where he is sometimes referred to as "Sir Nodward of Holdershire". 2001 - Featured on Ricky Tomlinson's record "Are You Looking At Me". 2004 - Guest Appearance On 'Max and Paddy's Road To Nowhere' playing garage mechanic Mick Bustin. 2005 - First appeared in the advertisment campaign for Nobby's Nuts. 2006 - Made a guest appearance in a music video for Misty's Big Adventure's single "Fashion Parade". 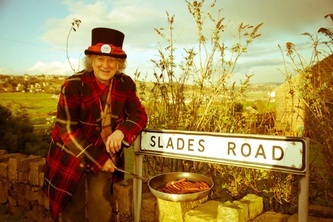 Over the years Noddy has voiced and appeared in many adverts for TV,film and radio and has presented over 30 editions of 'Noddy's Electric Ladyland' on the Men & Motors channel. He has been immortalized as a puppet "Banger" on the TV show 'Bob The Builder' and has appeared as a team captain on the BBC's 'A Question of Pop'. 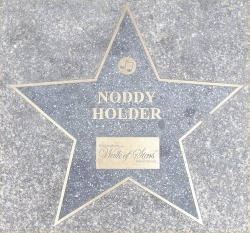 On the 9th December 2007 Noddy became the third person to be inducted onto The Birmingham Walk Of Stars on Broad Street,attracting a crowd of 27,000 people for the actual induction ceremony. On the 24th December 2008 Noddy appeared on the BBC's popular television quiz show 'Have I Got News For You' as a member of Paul Merton's team. Noddy now lives in Prestbury,Cheshire with his wife TV producer Suzan Price and their son Django who was born in 1995. Noddy also has two daughters from his previous marriage to Leandra. Noddy & Suzan appeared on the TV programme 'All Star Mr & Mrs' on 30th January 2010 and won - they donated the £30,000 to the charity NSPCC. 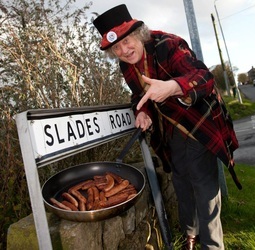 Noddy Promotes the brilliance of The British Banger by travelling around the British Isles and awarding the winners of each region with a framed gold disc for best sausage. Classically trained musician Jimmy joined Don and Dave in The N'Betweens in 1966 aged 16 shortly before Noddy completed the lineup that was to become Slade. Jimmy's bass guitar playing style was unique at the time as he played very fast. As well as Bass Guitar, Jim also plays Violin, Guitar and Piano/Keyboards. He became Slade's principle songwriter along with Noddy Holder, mainly writing the melodies while Nod concentrated on the lyrics. 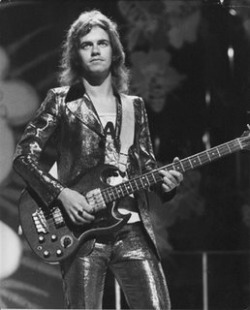 Slade's final two singles in the early '90's "Radio Wall Of Sound" (Lea on lead vocals) and "Universe" were entirely written and produced by Jim. During the 1980's Jim turned his talents to producing and produced Slade's recording sessions,although some single releases were left to other producers. He also produced other artists and released singles under odd pseudonyms such as "The China Dolls", "Greenfields Of Tong" and "The Dummies". An album was also released under "The Dummies" name which consisted of all the demos and single tracks that he had recorded with his brother Frank and wife Louise. Lea left Slade after Holder's departure from the band in the early '90's, being of the opinion that Slade was all four of them or nothing. He studied psychotherapy but never took it up as a full-time career. 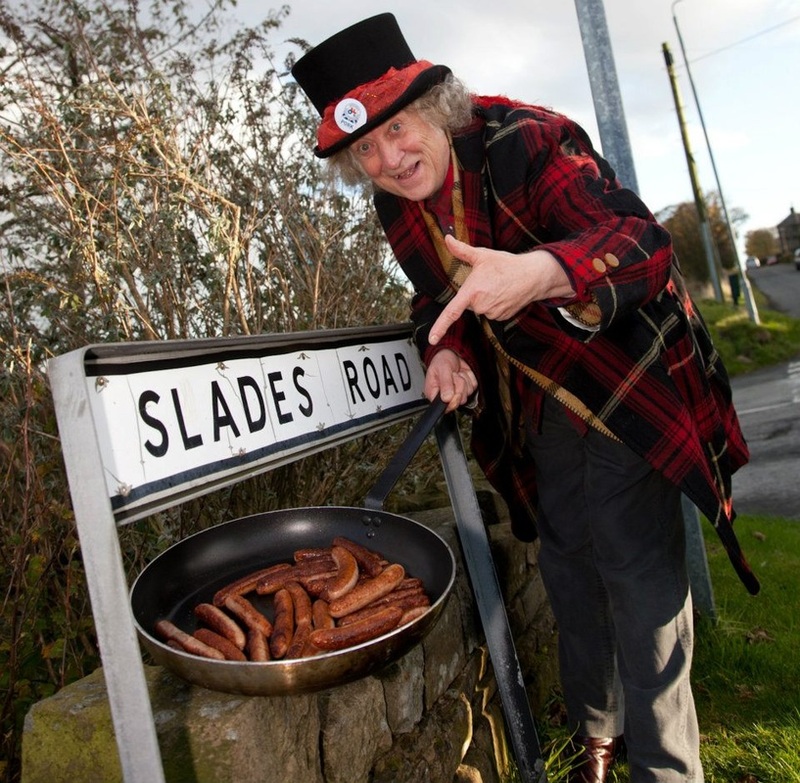 Since Slade stopped touring in 1984, Jim has performed live only twice; once for a local protest against a motorway development in his home area and once again on the 16th November 2002 for a charity event at the Robin 2 venue in Bilston near Slade's old local pub The Trumpet. For a while Jim spent time re-mastering Slade albums for cd and compiled a Greatest Hits Collection "Feel The Noize" for Polydor. In 2007 he released his first solo album "Therapy". In 2009 "Therapy" was released again as a double cd package, the second disc consisting of the Robin 2 live performance. Jim married his first girlfriend Louise Ganner on the 19th March 1973 and they have been together ever since. They have two children,Kristian and Bonny,as well as two grandchildren. They live quietly out of the public eye in Brewood,Staffordshire.